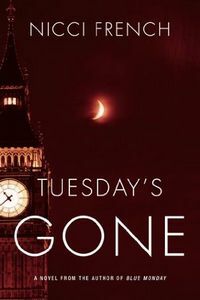 Tuesday's Gone by Nicci French: Synopsis and Online Purchase Options. Synopsis (from the publisher): A London social worker makes a routine home visit only to discover her client, Michelle Doyce, serving afternoon tea to a naked, decomposing corpse. With no clues as to the dead man's identity, Chief Inspector Karlsson again calls upon Frieda for help. She discovers that the body belongs to Robert Poole, con man extraordinaire. But Frieda can't shake the feeling that the past isn't done with her yet. Did someone kill Poole to embroil her in the investigation? And if so, is Frieda herself the next victim?